The basic theory involved in card counting is to ascertain the likeliness of next card you are going to deal with being the one you wish to have. For example - in a blackjack game involving 52 cards, the most likely outcome of the first card to be an ace is 4 out of 52 i.e., one in 13. Actually you can always get a blackjack bonus for starting gaming. With the progress of the game and having dealt with 12 cards and no outcome yet being an ace, higher is the chance of next card to have an ace. There are forty cards left including 4 aces, so chances of having an ace next is 4 in 40 i.e., 1 in 10. However, the casinos have two advantages which stop such simplistic method of counting the card from being effective. The casinos use more than one deck & there's a stop point through a way in the shoe, as never to deal all cards from one shoe. Nevertheless, the strategy of simple card counting can be effectively followed by employing "Plus or Minus" system. 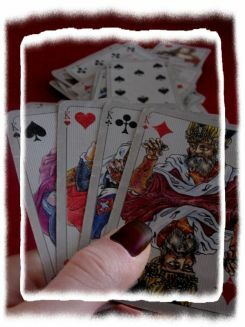 With the progress of the game the player maintains a running count of each card dealt with on the table by adding 1 in case of cards 2, 3, 4, 5 or 6and deducting 1 in case the dealt card is a 10, Jack, Queen, King or Ace. Though very difficult to trace out, the casinos dislike the players practising card counting. A casual player using the method of card counting to win a modest sum is unlikely to be detected. History of blackjack saw many bans and changes. The casino men start suspecting a player who bets large sum on a hand and a small sum on the next & consistently keeps winning with any degree. The casinos being privately owned premises can ban any player whom they suspect of practising card counting, though the practice of counting cards is not illegal. In case you try to enter into such casinos again, it is qualifies as trespassing. Universally, the casinos expel and ban somewhere around 1000 patrons on the charge of disorderly behaviour for whom they suspect for card counting.